It’s clear that the current trans-Atlantic Trump tweetstorm has kicked up a real storm. “Theresa @theresamay, don’t focus on me, focus on the destructive Radical Islamic Terrorism that is taking place within the United Kingdom. 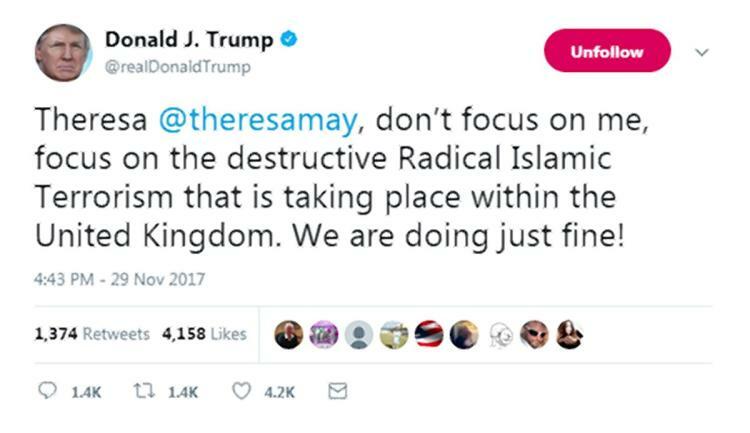 We are doing just fine,” he tweeted.
.@Theresa_May, don’t focus on me, focus on the destructive Radical Islamic Terrorism that is taking place within the United Kingdom. We are doing just fine! Trump initially addressed his tweet to a Twitter handle that was not May‘s, though he later retweeted to the British leader’s correct account. Trump truculent response prompted a new round of indignation and anger in Britain, where there have been several major Islamist militant attacks this year, with one minister describing Trump’s tweets as “alarming and despairing”. London’s Muslim mayor, Sadiq Khan, a Muslim, said May should withdraw an offer of a state visit to Britain which has already been extended. Trump provoked the initial wave of anger and disgust from politicians in Britain and human rights groups in the United States when he shared anti-Muslim videos posted by Jayda Fransen, deputy leader of the group Britain First. Fransen, who was convicted this month of abusing a Muslim woman and whose group wants to ban Islam, is facing further criminal charges of racially aggravated harassment. The videos shared by Trump purported to show a group of people who were Muslims beating a teenage boy to death, battering a boy on crutches and destroying a Christian statue. Others piled on: “We have been clear: President Donald Trump was wrong to retweet videos by far-right group Britain First,” Home Secretary (interior minister) Amber Rudd told parliament. Brendan Cox, the husband of lawmaker Jo Cox who was murdered in 2016 by a far-right extremist and Justin Welby, the spiritual head of the Anglican Church, were among those expressing outrage at Trump’s latest tweet. Lawmakers from the across the political divide were also united in condemnation. May angered Trump’s many critics in Britain then by extending an invitation to make a state visit to Britain with all the pomp and pageantry it brings including a formal banquet with Queen Elizabeth. Despite repeated calls from opposition lawmakers to cancel this, Rudd said the invitation still stood although a timing had not been agreed. She also said the close U.S.-British relationship which allowed the intelligence agencies to share information was vital and had saved lives.